As of March 2011, Wintermuse is 4 months old. She was born on October 31st – Halloween – in 2010. 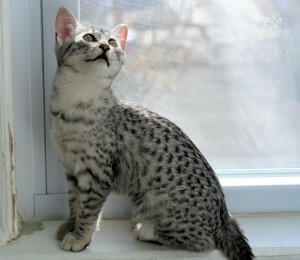 She is a silver Egyptian Mau purchased from Arietta Cattery in southern New Jersey. Her mother, a smoke, was a 2010 TICA champion in the kitten and adult categories. Wintermuse is 3 lbs right now and will grow to be 6-8 lbs. She’s a petite girl, as you can see. Her eyes are currently green-grey like mine, rather than the bright gooseberry green associated with Egyptian Maus. That may change as she gets older. She loves to eat, play, sleep, and yell. Egyptian Maus are a vocal breed, and Win never shuts up. Never. NEVER. Sometimes we call her Squeaky. On bad days, we call her Claxon. Her actual name, Wintermuse SteppinRazor, is from the amazing book Neuromancer. Lou and I are both computer geeks that love books. WintermuTe is an Artificial Intelligence that plays a key role in the book, and Molly, ne SteppinRazor, is another character that is more badass than Lisbeth Salander can even dream of. We changed it from Mute to Muse because our kitten is CLEARLY not mute, and, for various reasons to be explained later on this blog, we have reason to believe she.. inspires.. winter weather. Her other hobbies include sitting on my laptop, opening tons of Firefox tabs, rebooting my computer, fetching me her toys with meaningful looks, knocking all my stuff over, and kicking litter all over the place. Wow, Maus in Australia! I’m surprised. I was talking to a woman in England who said when she got her Mau a few years ago, it was one of just 20 in Great Britain! I wonder how many are in Australia. Send pics sometime! Looks like Katzmau was the breeder for some of our Australian folks, but that’s far from Perth. I had to put my Mau down this week because of heart disease. I am dying inside and her siblings are a wreck! I am looking for a silver female, please let me know if you can help us. I love your beautiful kitty! We just adopted a mau, Arrow (named after Cleopatra’s pet snow leopard) and he is a cutie!!! Does anyone know a good breeder?